Vancouver Apostille, Authentication and Legalization Services is what we have specialized in for 25 years, helping people to use their Canadian document internationally worry free. Whether it’s Apostille or Authentication Legalization of a British Columbia Birth Certificate, Marriage Certificate, Death Certificate, University Degree, Power of Attorney, Police Check or Corporation Certificate our experts have worked with all types of documents. 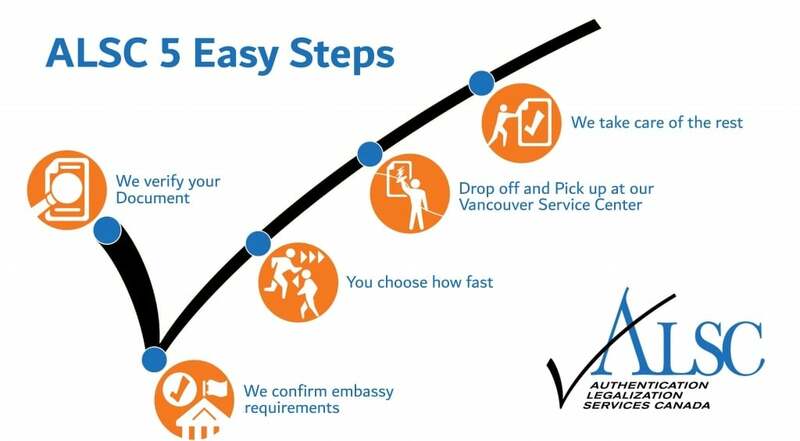 Our Vancouver Apostille Authentication Legalization Services are easily accessible if you live in Burnaby, Richmond, Surrey(See more about our newly opened Surrey ALSC Service Center), Coquitlam or anywhere in British Columbia, we make it easy for you. Vancouver Notary Services for Apostille Authentication Legalization – Do I need a Notary to complete the process? To clear up some confusion, as there seems to be a lot of misinformation on the subject, in most cases you do not need a Vancouver notary or a BC notary to sign your document in order for it to be authenticated and legalized or what some countries call an Apostille. Truth of the matter is that most documents qualify using the signature of the authority who issued it. Further to this in some countries you can only use the original document issued by the authority so a notary is not required. What it may do is add extra cost and time to an already costly and lengthy process for some. If a notary is required in order to authenticate your document one of our experienced experts will advise you, but to be clear usually a notary is not required. Trust Canada’s experts who specialize in these matters to make sure it gets done on time and budget for you. Why Do I Need to Authenticate My Document at Global Affairs Canada Ottawa? Although we do have an Authentication Legalization Service Center in Vancouver all federal authentication of documents is completed here in Ottawa. This is because Global Affairs Canada Authentication Services Section has only one office and that’s where it’s located. Not to be confused, there is a British Columbia provincial authentication of documents office located in Victoria but it only authenticates documents that have been issued in British Columbia. They are conveniently located close to our Victoria Authentication Legalization Service Center. It’s important to know that most embassies require the federal authentication of document stamp issued by Global Affairs Canada to legalize your document or to be the equivalent of an Apostille. There are two countries who currently require the British Columbia authentication stamp only, and if using our services we will advise you if this is the case for your document. Depending on the type of document that you have Global Affairs Canada has certain requirements that have to be followed in order for it to be authenticated. These authentication requirements can change but not to worry our experts, who work with them daily, will make sure your document qualifies and is authenticated on time, guaranteed. The most common BC documents that we authenticate at Global Affairs Canada are what are called vital statistics documents. As an example a Birth Certificate, Marriage Certificate, Death Certificate are vital statistics documents. Depending on why you may be using your vital statistics document will answer the question of whether you need to use an original or if maybe a notarized copy will be suffice. If you do need to use an original many of our clients find it easier to order a new one for the process which is easy to do online. Authentication and Legalization of educational documents has been a specialty of ALSC and over the past 25 years its been a great pleasure assisting those looking for work abroad. If this is you we know that the task of moving and working in a new country can be challenging enough without working through the web of official documents that you need. After consulting with one of our specialist we will help clarify what you need to do to meet the requirements. Some of our clients do need to request originals from their University Registrar and if that’s the case for you see the below links to help. Our corporate document authentication and legalization specialists are the best in the country with a wide knowledge of the particular documents required for doing business in a foreign country. If your firm has been asked to provide a corporate document in a foreign country there is a good chance you will be asked to have it authenticated and legalized or what some countries will call Apostille. If you need assistance with this give us a call we can walk through the steps that are required to have your corporate document recognized in a foreign country. You can do this process yourself, currently the processing time for Global Affairs Canada is a minimum of 15 business days to authenticate a document if you are using their mail in service. The advantage of using our in person service is that we can authenticate a document in 1, 3, 10 business days depending on how quickly you want it done to meet your timeline. Unlike Global Affairs Canada we keep you updated from start to finish to make sure you know what’s going on with your document. If dealing with Global Affairs Canada directly and there is any issue with your document it will take 15 business days before they can help you due to their work loads. As most of our clients need it done quickly and correctly our service is an easy choice. The Final step in making your document valid for use in a foreign country is that it needs to be signed and stamped by the embassy consulate. This process is called legalization and is required for a document to be the equivalent of an apostille. If you are in Vancouver, you can attend at some of the consulates to do this step yourself, but remember they may have requirements and charge a fee. To make sure you get it all correct if doing it yourself you may want to make contact with them. 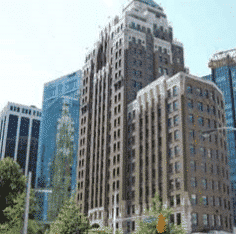 To help you we have listed some of the Vancouver Embassy Consulates below. Of course we would still be happy to handle the authentication stage for you if you are doing the legalization step yourself. Most of our clients prefer that we provide both steps and being that the legalization step at the embassy can be the most difficult step our expertise comes in handy. Using our services guarantees a stress free process as we keep you updated on any requirements or extras that you may require with having your document legalized at the embassy consulate. Authenticate and Legalize a document in Vancouver BC- What is the quickest way? To get quick and easy apostille, authentication, legalization services in Vancouver is simple. We know because we have done the hard work for you. By following our simple steps below, we ensure that your document is processed on time and correctly for use internationally. 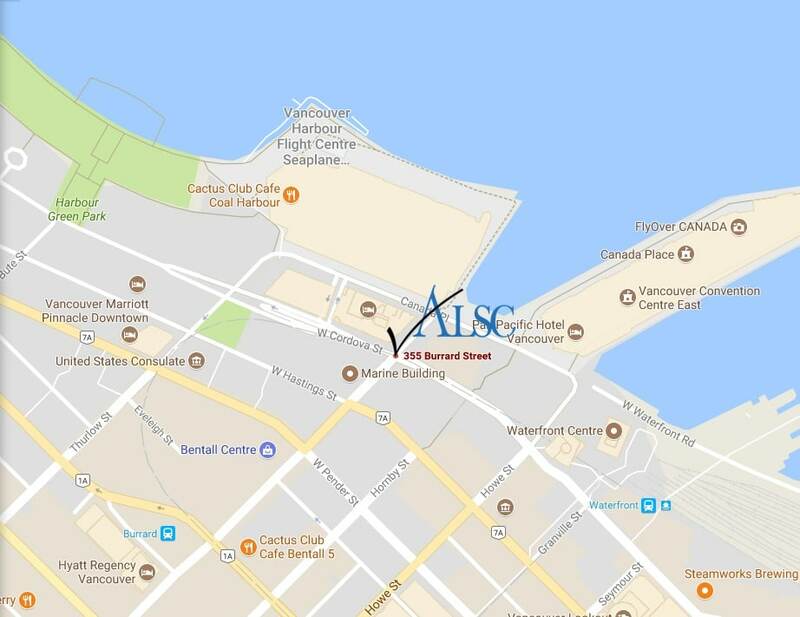 Once you have confirmed your service options we can then set up an appointment for you to drop off your documents and ALSC order forms at the Authentication Legalization Services Canada – Vancouver Service Center Suite 1000 – 355 Burrard Street, Vancouver, B.C. V6C 2G8. They will be waiting for you at the Vancouver Service Center to ship the documents overnight to our national headquarters in Ottawa, where the documents will be processed. Now we do our part keeping you updated at every step via email. Upon completion of the process we let you know when you can pick up your completed documents at our Vancouver Service Center, it’s that simple. Best of all it’s guaranteed! Click below to get started with the Vancover Apostille, Authentication and Legalization Specialists.